The other day I was craving the flavors I enjoyed so much when I was in India several months ago. I was at work and so I asked my Nepalese co-worker and friend, Priti, for some tips on getting the curry just right. By the time I got off work, I was so excited to get cooking (and eating) and, sure enough, the aromas brought me back to my time spent in India. What I loved about the Indian cuisine the most was that, while most of the food they cooked was vegan or vegetarian, it never felt lacking in any way. On the contrary, they seemed to have endless combinations of amazing vegetables (some I'd never heard of, let alone tasted), seasonings, and textures. The food was rich and varied, flavorful and satisfying. Even the plane food I had during the trip was out-of-this-world delicious. So I fused the tips from Priti with the memories of curry from my trip (in traditional Nepalese curries, they don't add coconut milk/cream like they do in southern Indian cooking). And, when I went to take a picture of my creation, I remembered a beautiful piece of fabric I had brought back from India. It made the perfect napkin! I ended up with a quick, healthy, and delicious dinner that left me feeling light, yet satisfied. It also made for great leftovers over the next few days. This is one I will enjoy throughout the fall and the ingredients can easily be traded for what's on-hand or seasonal (I can't wait to try it with fall squash and pumpkin!). I hope you enjoy as much as my boyfriend and I did! Heat coconut oil in large pot over medium-high heat. Add veggies in the order they are listed (onions, carrots, fingerling potatoes, tomatoes, mushrooms) giving each a minute or so to cook and slightly brown, but not over-cooking. 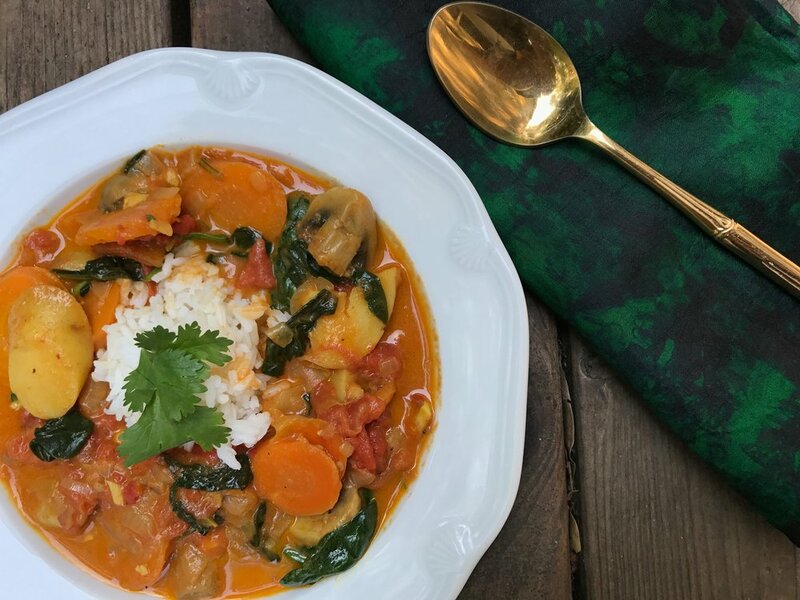 Before adding the spinach and coconut milk, add in the seasonings and coat the veggies, giving them a few minutes to further cook and develop flavor. Add in coconut milk and turn heat to low. Simmer for at least ten minutes (or longer if you have time), adding the spinach just before you are ready to serve. Spoon over rice or noodles (kelp noodles would be great if you're avoiding grains) of your choice and top with cilantro. I think if you would have asked me this question not long ago, I would have thought curry powder was it's own spice, however curry powder is actually a blend of other spices. Who knew?! (maybe you did and I'm just late to the party). This means you could actually blend your own, if you felt so inclined! Or if you were out, and have an ample spice rack, you could make some using what you have. I love using this spice on oven roasted veggies like butternut squash and cauliflower. What are your favorite uses for curry powder? Please share in the comments!